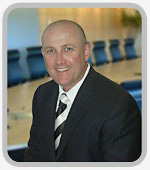 How Can a Family Trust NZ Help You? It is like an insurance policy. Among other benefits, they are designed to protect you from an adverse event, if and when one happens. It’s obvious that we don’t know what those ‘events’ could be for you. We hope they never occur…They may never happen and if they do, the effects may only be minor. On the other hand, one could be so devastating to you, your family and your life, that it could have a permanent effect on you, your assets, your cash flow, your happiness, and the people you love. Please understand, it’s not our intention to scare anyone. But as pragmatic professionals who deal with trusts for New Zealanders’ financial affairs and assets on a daily basis, we get to see the extreme and often horrendous results that come with NOT BEING PREPARED. Besides, if one of these events does happen to you, the last thing you’d want to do is worry about whether your financial future was protected – right? Some accountants may find family trusts terrifically fascinating, but for the majority of New Zealanders they are not really that exciting. Owning a business, owning some property, planning your estate for future generations, or owning investments and NOT seeking professional trust advice is a bit like jumping out of an airplane before checking to see if the parachute is strapped on…it’s crazy. What are the Advantages of Setting up Family Trusts? One of the most common private and business ownership structures in New Zealand, is a discretionary trust. Their advantages are broad and flow across asset protection, estate planning and taxation benefits. 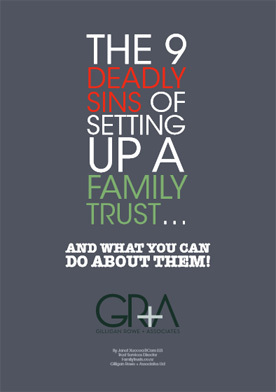 GRA have a division dedicated to forming and managing trusts. We utilise internal resources and, where necessary, external law firms to set up and support our clients as required in this area. Preparation of a memorandum of wishes (MOW), in which our clients describe to the trustees what they wish to have happen after death. Generally we recommend separate trusts be spawned for the children or final beneficiaries, so that the wealth passed through is sheltered from matrimonial (relationship) property claims and creditors. We further recommend that clients specify an age children must achieve before they become entitled to such trust funds, and encourage such age to be when the children have matured. A 21-year-old with $1m+ inheritance is not in our view ideal - most 21-year-old children become spoiled with an early inheritance and squander it, later to regret not being more frugal. We in fact recommend 30 as the specified age for distribution to occur, leaving your children until then to mature and grow a respect for the value of capital and wealth. While a personal matter that needs to be tailored to a client's affairs, generally our view is later (30+) is better for inheritances to flow through, as part of someone's financial education is growing up poor. Provision for control of the trust should be thought through carefully. We recommend that you do not leave your lawyers and accountants in charge of your trust fund, running your estate (as executors) or appointors (the person with the power to appoint and remove trustees). We call this the 'gravy train', and in our time in practice we have seen many examples of accountants and lawyers that have been slow to manage clients' affairs they have such control over, or have overcharged for the management, and the beneficiaries can do nothing about it. In our view, control should vest to the final beneficiaries jointly, such that the children (or whoever) can change accountant and lawyer to whom they wish, especially if the professional is not performing or is overcharging. It frustrates the heck out of us. Why are people happy to plan for success but not for failure? It’s true if you think about it. We set goals to start or change careers, buy property, or start new businesses. Some people create meticulously detailed plans which they can implement that will (hopefully) lead to their success. We also spend huge sums of money and hundreds of hours on books, education, training, seminars, and mentors to help us feel successful. And all the while, measures to safeguard ourselves in case of failure hardly get a mention. Properly setting up and managing a trust, is like your own personal plan B. The only difference is that the cost of planning for failure is way lower than the cost of planning to succeed…or the cost of doing nothing. Taking the first step to protecting yourself and your future is all it takes. Waiting until the liquidator is appointed, or until after the death of your spouse (or whatever), is never the right time to seek advice. Thanks to the internet, if you have the time, you can find out almost anything to do with anything when it comes to trusts in New Zealand. The amount of information available (including misinformation) is staggering…and potentially dangerous. In fact, it’s one of the reasons we offer a Family Trust Rescue Service to help people fix their ‘sham’ trusts and regain the protection they initially thought they had. But that’s another story. Have a quick look at this short video. At the heart of it all, we are chartered accountants. We’ve been doing it successfully since 1992. From individuals to large organisations, we provide a full range of professional services. But read on to discover the two reasons why we truly are different and why we deliver the very best, cost-effective VALUE to anyone seeking asset protection in New Zealand. Because we’re established and innovative market leaders, we’re well known in our industry. This means that as our client, you know you’ll be in trusted professional hands. 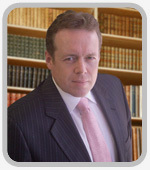 We (Matthew Gilligan & Janet Xuccoa) are sought-after speakers, commentators and contributors on financial services and legal matters. We’re often called on by various groups to make sense of financial issues that affect the lives of New Zealanders. We offer an ‘integrated’ approach, we break the traditional mould of accounting firms and business advisors. 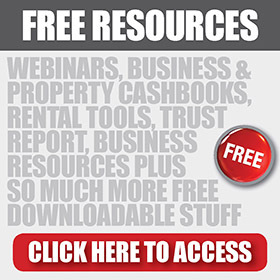 It’s not just a matter of setting up a trust and dumping all your property into it. You need to go further and analyse the risk management, estate planning and taxation issues at the same time. We have the right people with the right expertise and experience, all in-house. Our ‘one-stop-shop’ approach saves you time, money and stress. Yes, anyone can sell you a parachute (even online)…but at Gilligan Rowe + Associates, we actually check for holes! Our final message is simple. Family trusts that we’ve set up and currently manage have solved big problems for our clients…but we’re NOT passionate about trusts! We’re passionate about how our work has helped thousands of Kiwis sleep better at night. We hope we can do the same for you. When setting up a trust, you have the option of having an independent trustee as a trustee. This is a person or entity that is not a beneficiary in the trust that votes on trust decisions and gives guidance on activities of the trust. While it is not necessary to have an independent trustee to have a valid trust we strongly recommend you do have an independent trustee. If you're going to put an independent trustee into your Trust, you might consider using the GRA Professional Trustee. We are the winners of the inaugural Corporate Trustee of New Zealand Award. This means we have been judged by our peers to be a market leader in the Trust arena. Utilising professional independent trustees in your trust is something that GRA recommends as best practice. In short, the law is moving towards supporting the position that the inclusion of an independent professional trustee makes your trust extremely robust and difficult for a creditor or a spouse to attack as a sham. Recent (2008 and 2009 cases) in the High Court and Court of Appeal (which we are happy to supply on request, including Wilson v OA and other cases) show judicial flavour supports the position that having a lawyer or accountant in your trust as your independent trustee, voting on decisions and minuting meetings, makes your trust very strong. When choosing your professional trustee, ensure they are of sound character and sufficient maturity and that they can take the task on properly, weighing up the various points Trustees need to consider when discharging their duties, ensuring at all times the Trust cannot be vied as a sham. 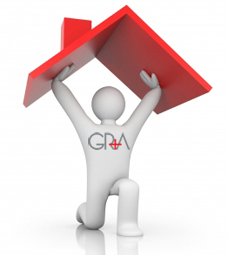 Don't be nervous in the belief that if you appoint the GRA Professional Trustee you will lose control of your assets. Typically, you hold the power of appointment (the power to fire such an independent trustee), so you can change the trustee should you choose to. And on death, you can will the power of appointment to your final beneficiaries jointly (or individually), giving them full control over your trust. With the benefit of the security of a professional trustee comes the cost of its professional services. Typically we charge a fixed fee annually for our membership of $450+ GST every January, and on top of this on a time and cost basis at a rate of $300+ GST for other work. Click below to request more information about our Professional Trustee Service. Setting up trusts and running them is a very personal thing, that needs tailoring and advice as to the asset protection, estate planning and taxation ramifications. Governance and succession after death of who controls and runs the trust also need careful attention. GRA help many Kiwis with all aspects of this process and invite you to contact us for assistance in setting up and running such structures. 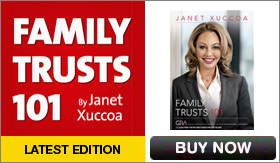 Click below to request an interview on setting up family trusts. 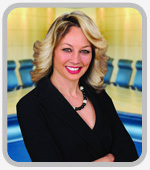 Janet Xuccoa and the Corporate Trustee team at Gilligan Rowe and Associates have been our Professional Trustee for our family trust and trading trust since May 2005. From the initial advice during the designing and creation of our trust structures through to the day to day operation of the entities, the support and guidance we have had from the Corporate Trustee team has been second to none. As a business owner and operator, I need to have reliable, efficient, proactive and knowledgeable people as part of our business team and Gilligan Rowe and Associates Trustee services tick the boxes in all of these criteria. I have no hesitation in commending and recommending Gilligan Rowe and Associates Trustee Services team to anyone who requires professional and competent guidance in the safe operation of their trust and in turn secure protection of their assets. 3. Dad, Where's My Inheritance? 11. Guess Who's Coming to Dinner? The Beneficiaries! 15. The Beneficiaries Want The Money...Help! 18. What is a Professional Trustee? Do I Really Need One? 19. Who Wants to Lose Their Assets? 21. Will's -What is Your Game Plan when YOU die?